Here's how the Trello integrations works: you connect Status Hero and Trello, select Trello boards to monitor, and Status Hero will match up relevant Trello card updates to your team members. Their updates will appear in the activity page and alongside their check-ins. Don't worry, only team and public boards are included. Activity from your private boards will remain private. To set up this integration, visit the integrations page in the team settings in Status Hero. Click open the Trello panel and click the "Connect Trello" button. You'll be prompted to authorize the integration by Trello. Once connected, select the Trello boards you'd like to monitor on the integrations page. To select multiple boards, use ctrl+select (cmd+select on Mac). 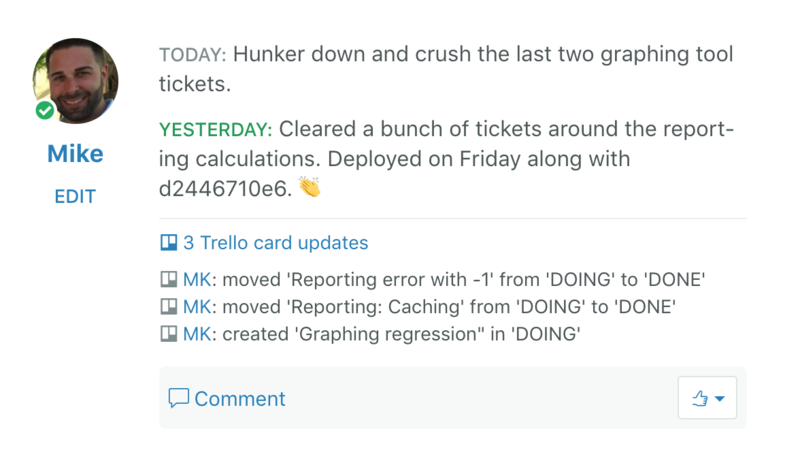 When someone from your team adds, updates, or archives a Trello card, Status Hero will add the activity to their check-in. Look for updates in the activity stream first. The check-ins on the dashboard will sum up commits from the previous period. (The check-ins essentially say "here's what I did yesterday, and here is the Trello activity to go along with that. Make sure that the update authors match up either by first and last name with people on your team in Status Hero. Note that only team-wide boards will show up for selection in Status Hero, not private ones. Status Hero won't be able to record data retroactively. Make sure you generate some activity in the boards you've selected in Trello in order to test things out after you've set up the connection.